Check out this new gladiator style novelty motorcycle helmet in chrome. Shines bright in the sunlight. This cool chrome biker helmet is not DOT approved. 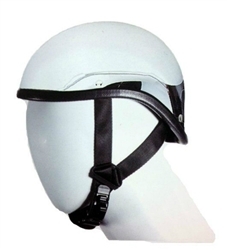 Novelty gloss black polo style motorcycle helmets with quick release buckle are available at Leather Bound Online. Wear this lightweight jockey forward or wear it backwards for a cool look. Remember theses "Jesse" style motorcycle helmets are not DOT approved. Feel patriotic while you ride, wearing the DOT approved smallest, lightweight motorcycle half helmet on the market from Daytona Helmets! 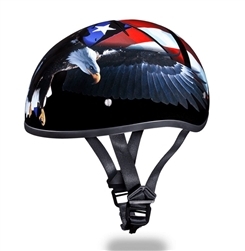 Lightweight, slim design with high gloss black finish with nice quality patriotic freedom eagle and USA flag graphics, with no visor. PLEASE NOTE: THIS IS A ROUGH GUIDE AND NOT EXACT. 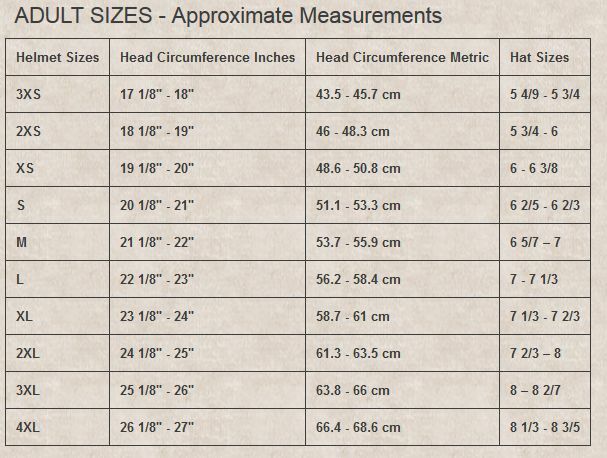 THE SHAPE OF YOUR HEAD IS AS IMPORTANT AS THE MEASUREMENT WHICH MAY AFFECT THE FINAL FIT! Electrician design deeply embossed in a 1 1/2" genuine top grain cowhide strip then cut and finished by hand and lacquered for long wearing durability. Two large snaps secure a buckle allow you to easily change buckles. Fancy fishing design deeply embossed in a 1 1/2" genuine top grain cowhide belt strip then finished by hand and lacquered for long wearing durability. Two large snaps secure a buckle and allow you to easily change buckles. The smallest DOT approved motorcycle helmet on the market from Daytona Helmets! Light-weight comfortable style in a flat black soft finish, with shorty bolt on visor. Easy to install, universal adjustable cell phone handle bar mount for motorcycles. 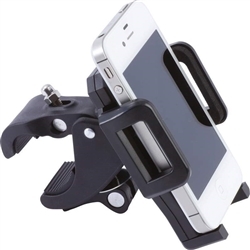 Keep your phone secure while riding with this phone holder.